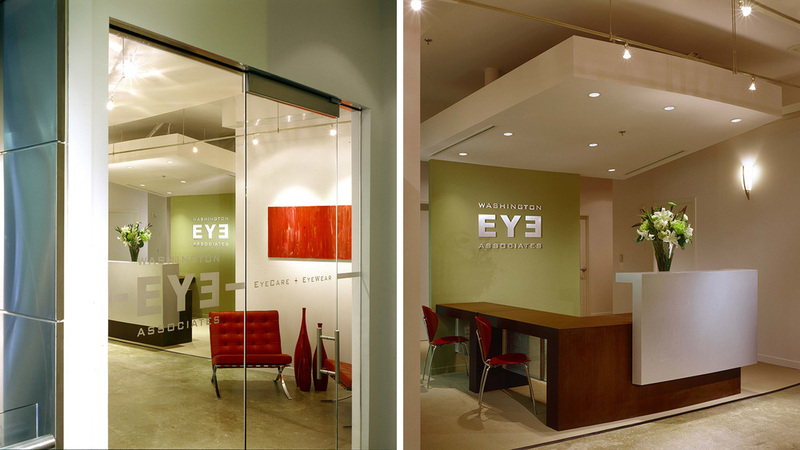 Directed by the client to design a space that would differentiate Washington Eye Associates from the multitude of other optometrist offices, Inscape Studio formed spatial divisions by creating a central hub surrounded by solids and voids. The central hubs acts as reception desk, payment center, fitting station and retail check out. Private spaces were created as solids (exam rooms, private office and laboratory) and encircle the hub, while public spaces were formed as voids between solids (open office, contact lens area and retail). Washington Eyes Associates sets itself apart from their competition with a design fashioned on sophistication and urban chic. The architect collaborated with Anonime, a local graphic and web-design studio, to frame the backdrop to the central hub with Washington Eye Associates' corporate identity. Besides designing the reception desk, the architect also designed the retail display cases that complete the sense of hip luxury.